A hearty word of welcome to you! Thanks for visiting Highland’s website! 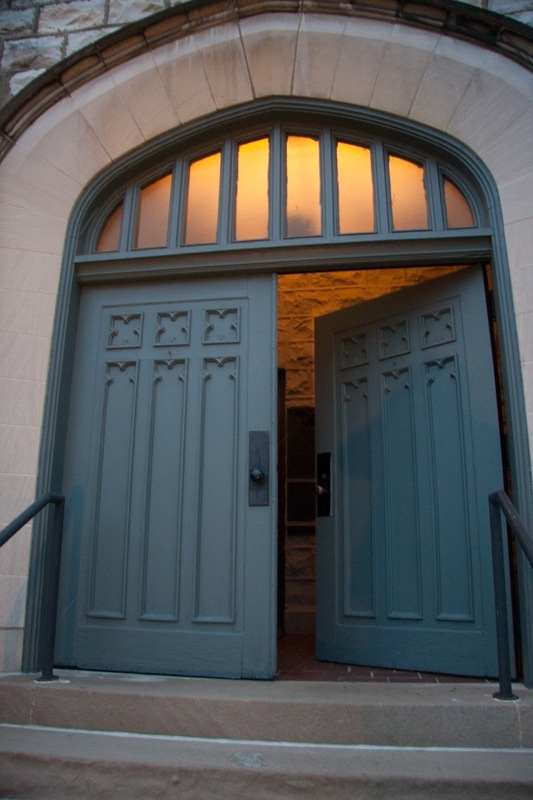 We hope you find our online ‘front door’ to reflect our mission statement – “intriguing, inviting, and inclusive” – answering questions you may have and drawing you closer to this community of faith striving to be agents of God’s transforming love in the world. The following Frequently Asked Questions may help you learn more about our church or assist you in planning your visit. What does Highland believe about (fill-in-the-blank)? Highland has found language that meaningfully describes who we are and how we engage in the world: we’re a “thinking, feeling, healing community of faith” that is called “to be so changed by God’s transforming love revealed in Jesus Christ that we are an intriguing, inviting, and inclusive community of faith, filled with generous hearts and passion for God’s justice.” Read more About Us here, and hear some of our members speak to this here. To be more specific, Highland follows God revealed in Jesus and is firmly rooted in historic Baptist principles of freedom – Bible freedom (we each have the right and responsibility to study and interpret the Bible), soul freedom (we each have the right and responsibility to engage with God without creed, government, and clergy interference), church freedom (our local church has the right and responsibility to shape our understanding of living out the call of the gospel without other churches’ interference), and religious freedom (our local church believes in the separation of church and state and the freedom OF religion, the freedom FOR religion, and the freedom FROM religion). Therefore, you won’t find many absolute statements of belief here. We know that we need God, and that all people need God. So YOU are invited to add your story to the larger narrative of how God is shaping and transforming us in Love. Bring your doubts and questions, your convictions and passions, as we do God’s work of love in the world! What organizations does Highland affiliate support? With whom does Highland affiliate? Read more about our affiliations, partnerships, and organizational support here. 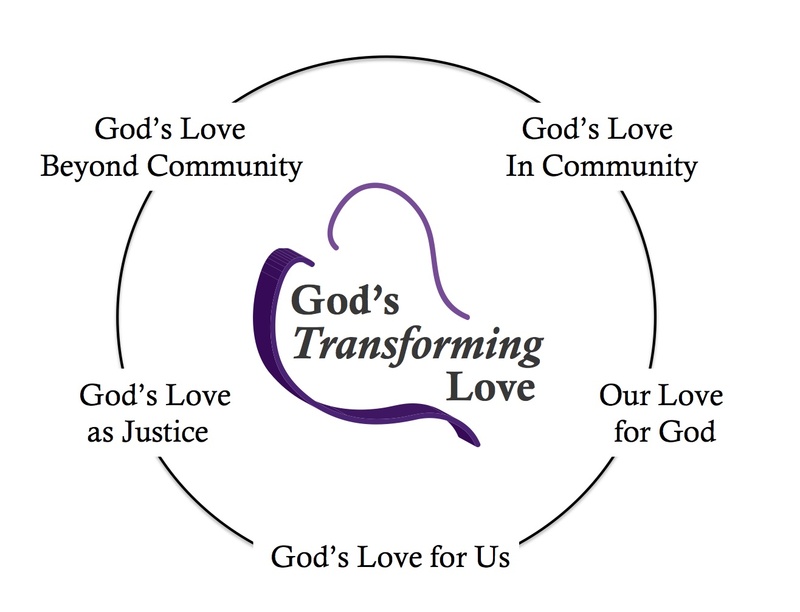 You all keep talking about “God’s Transforming Love”… can you explain further what you mean by that? In 2010, Highland began to think about what orients this “thinking, feeling, healing community of faith.” It seemed that in the midst of numeric and programmatic “success,” we found ourselves doing an array of initiatives to promote God’s work of love, but hadn’t named the orienting framework upon which our church built its unique expression of faith. Another way we learned to name our need was to ask: What is our WHY? This phrase builds on the mystery and mercy of God, who is Love, who created the world by love, because of love, for love. We see that God’s deliverance to Adam and Abraham and Ishmael and Israel and Moses and ultimately to all the world in Jesus is a love-centered enterprise. This God-Love forms and heals us; it compels us and consecrates us; it orients our journey and frames our language. 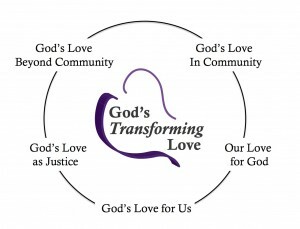 We’ve envisioned ourselves in a kind of dance around the center pole of God’s Transforming Love. You can enter the dance through any “door.” You can join the dancing even if you don’t yet know the tune or the lyrics, even if you don’t yet know what you think of God (there’s a lot of people out there for whom “God” is a scary or off-putting word). Enter any door. Stand on the edges for a while to get your bearings if you need to. Then join in when you’re ready. What programs does Highland have for ME? Highland wants to be a community that provides space for ALL people to encounter God in a variety of ways! 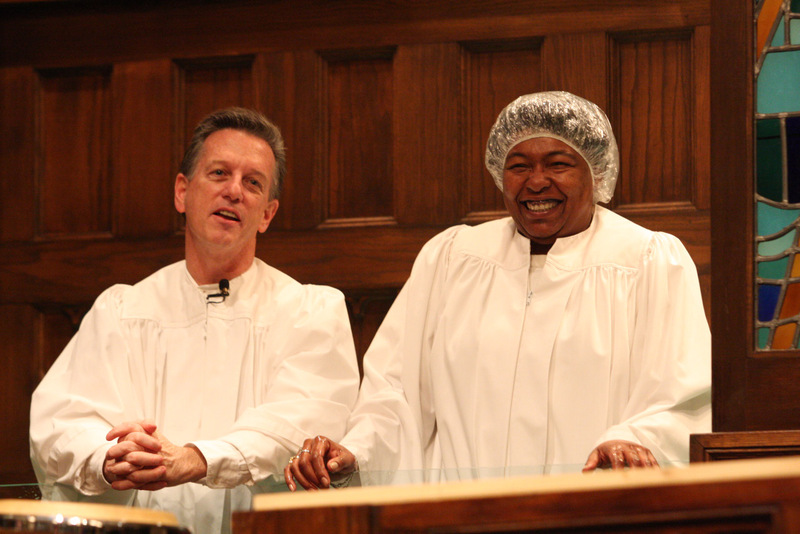 Read more in our Congregational Life section about ministries for a variety of ages, life stages, and needs. Read more in our Community Outreach section about ways that our folks are engaging in the community and the world. What does worship at Highland look like, and when does Highland gather for worship? Regardless of what service you choose to attend, worship at Highland is full of warmth: heart-felt faith, life-giving music, honest confessions, fervent prayers, challenging scriptures, inspiring sermons, and stories from all types of travelers on the journey of faith. We gather for worship four times a week – Fridays at 7:00 p.m. and Sundays at 8:30 a.m., 9:30 a.m., and 11:00 a.m. Click on each time to read more about the distinct flavor of each service. Wear what makes you feel comfortable and enables you to be fully present in this sacred hour of worship. Some dress business casual, others completely casual, still others feel better attending church in a dress or sport coat. Parking IS indeed a creative challenge at Highland! We are a land-locked yet growing church, located in the eclectic and delightfully local community of the Highlands in Louisville. Take a minute to explore our Parking and Directions page as you plan your visit. Please note that there are Visitor Parking spots in our back parking lot for your use! Is care for my child provided during worship services? Yes! At Highland, we seek to provide sacred encounters during worship for all ages. Read more about the ways Highland engages your children during worship here. 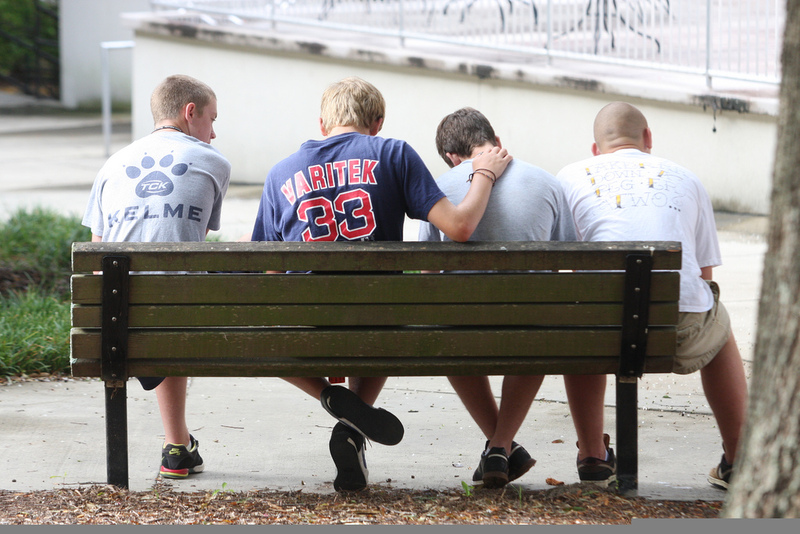 What is available for my child or teenager on Sunday mornings? Highland takes seriously its call to form children and youth to be agents of God’s love in the world. We do so through Sunday morning Bible Study for all ages, and our ministries to children and youth are robust and dynamic centers of creative instruction on Sunday mornings. Read more about Bible Study for children here, and read more about Bible Study for youth here. What do Wednesday nights look like? What is available for my child or teenager on Wednesdays? Wednesday nights are our church’s time to gather mid-week for fellowship, community, and spiritual formation for all ages. Read more about Wednesday nights here. I’m concerned about my physical challenges or the challenges of someone in my family. Is Highland equipped and accessible? Highland main parking lot is found behind the building, sandwiched in the alley between Grinstead and Everett. By entering through the glass doors from the back parking lot, a ramp will lead you into the Fellowship Hall to the main elevator. 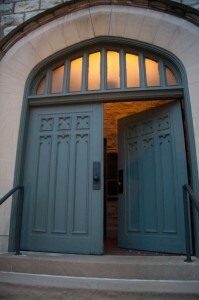 The double glass doors between the education building and the Sanctuary building is another entry point that is close to the elevator and free of stairs. Our central elevator reaches every floor of our building where we gather for worship and Bible Study – the ground floor for Fellowship Hall, the first floor for classrooms and the Sanctuary, and the second floor for children and youth space. As you enter the Sanctuary from the Commons, immediately in front of you on the organ side is a space designated for people in wheelchairs and any caregivers that accompany them. Highland is proud of our growing community of people who are hearing-impaired. In our 11:00 a.m. service, a sign-language interpreter is located at the front of the Sanctuary on the piano side. There is a unisex, easily-accessible restroom just off the Sanctuary in the Commons. Listening devices are available in the back of the Sanctuary with Gary Waller, our sound technician. Please don’t hesitate to ask an usher or deacon (wearing name badges) to assist you if needed. There is a defibrillator on-site should it be needed. I’m concerned about my food allergies or the allergies of someone in my family. How does Highland handle food sensitivities? All bread served during communion is gluten-free. We serve grape juice instead of wine during communion. All snacks served for children are peanut-free and tree nut-free. We are sensitive to food allergies in preparation for our community meals. Please contact Renee Purtlebaugh for more details.